This decked-out Soma Wolverine was built for a customer in San Jose, CA. 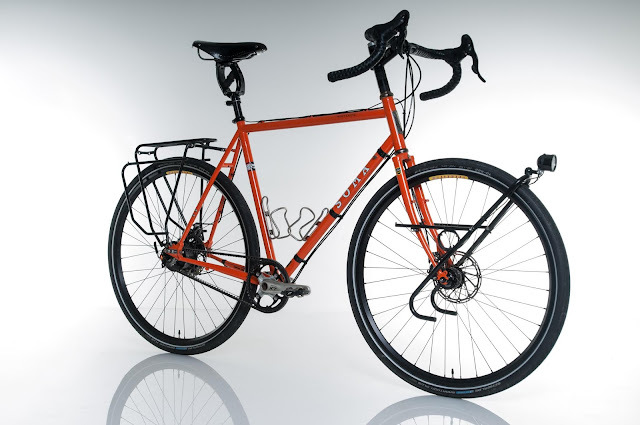 The rider was looking for a rugged commuter bike that would be efficient on his daily trips to work, but would also offer the versatility to enjoy longer tours on the weekend and even a few cycling-oriented vacations. 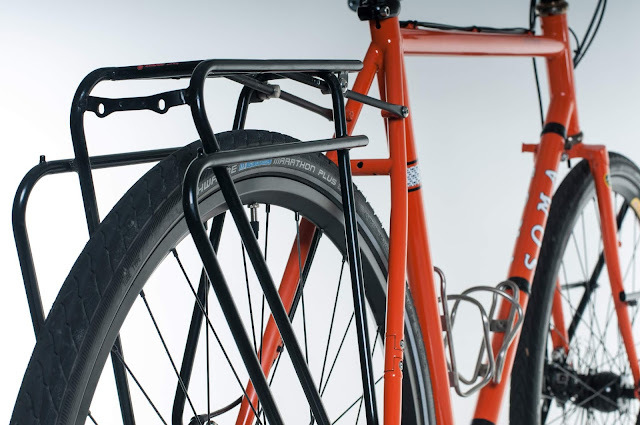 Soma’s Wolverine frame fit the bill as a sturdy option that is affordable, works well with a Rohloff hub, and is belt-ready. Like many of our customers, the rider was drawn to the simplicity and hassle-free nature of the Rohloff SPEEDHUB 500/14 internal gear hub and Gates Carbon Drive belt drivetrain. Shifting duties are handled by a set of Campagnolo Veloce shifters driving a Gebla Rohbox. A dynamo hub and lights from Schmidt, which are self-powered, were also high on the list of requirements for daily utilitarian use. From there, Cycle Monkey rounded out the build with a variety of high end parts to create a top quality commuter that isn’t afraid to stray off the beaten path. Soma Fabrications, whose South San Francisco headquarters are located a stone’s throw from Cycle Monkey, offers affordable steel frames that are often considered an alternative to Surly. Price, intended use, and many features are similar, but the sliding dropouts and belt drive compatibility of certain Soma models, like the Wolverine, easily check the boxes for many of the build requests we see at Cycle Monkey. Compared to the horizontal dropouts used by Surly, sliding vertical dropouts allow you to swap wheels more easily. 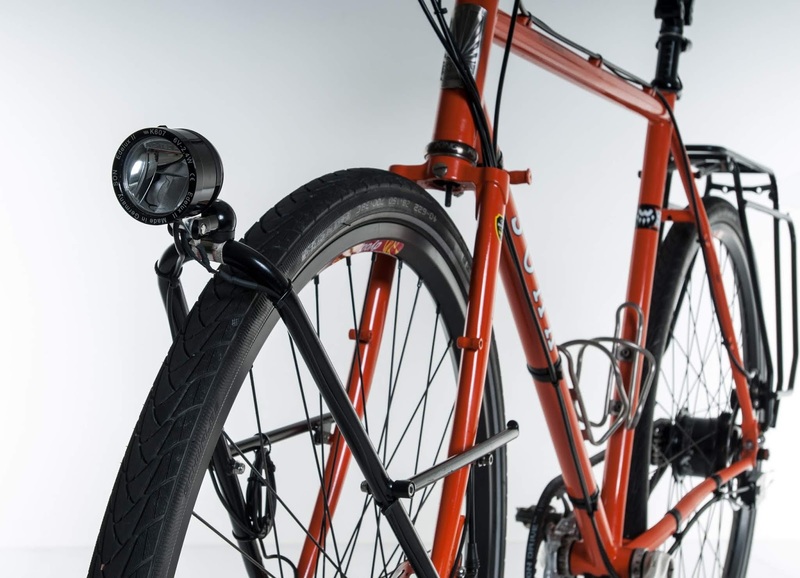 The Wolverine also features a handy split in the right seatstay, which allows a belt to be installed without the frame modifications required with Surly frames. Look closely, and you'll see a split in the right seatstay, which allows for easy installation of the Gates Carbon Drive belt. Soma says the original intention for the Wolverine was to build a monster cross bike—basically a drop bar bike with cyclocross geometry and cross country mountain bike wheels. The idea was to create a fully-capable off-road touring rig that would also be sporty enough for commuting through the city and all-around adventure riding. The Wolverine is capable of running a wide variety of drivetrains, including the ultra low maintenance setup included with this build. 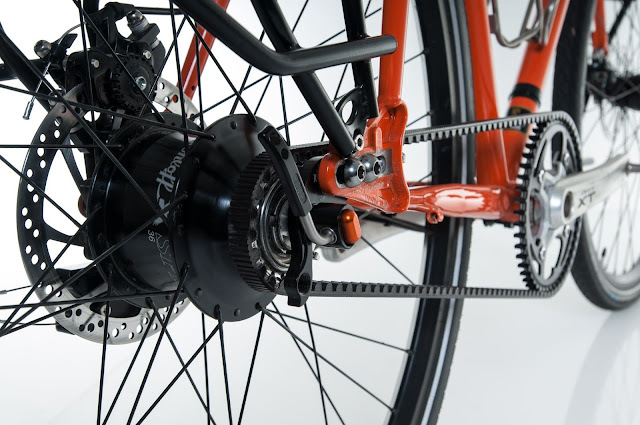 Rohloff’s SPEEDHUB 500/14 is an internal gearing system with 14 evenly-indexed speeds entirely encased in the rear hub. In addition to the benefits of such a wide gear range, the internal nature of the gearing makes it virtually impervious to the elements, making it an ideal option for both off-road use and year-round riding. Even for daily commuters like this rider, the only service required is an annual oil change, which can be completed at home or by Cycle Monkey. 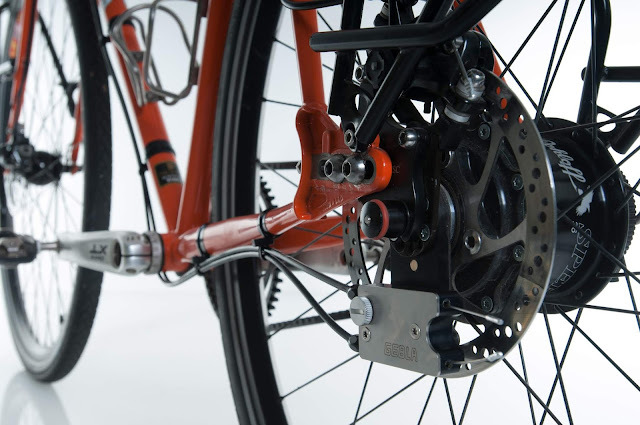 Rohloff's SPEEDHUB and the Gates Carbon Drive belt system are an easy fit with the Wolverine's sliding vertical dropouts. Looking for the ultimate in reliability and lack of maintenance, this rider paired the Gates Carbon Drive belt system with his Rohloff hub. Belt drive systems don’t rust in inclement weather and they don’t require lubrication. Simply wipe ‘em down after a particularly dirty ride, and you’re good to go again. We also see Gates Carbon Drive belts lasting 5-10x longer than your average chain and they do not stretch—meaning you won’t have to readjust the dropouts to maintain belt tension. Rohloff SPEEDHUBs are typically activated with a twist shifter, which can be mounted to the end of drop bars with an adapter. Many riders, like the owner of this Wolverine, prefer the feel of traditional road bike brake lever shifters (brifters) on their drop bar bikes. Gebla’s Rohbox allows you to run the SPEEDHUB in tandem with brifters from SRAM or Campagnolo, making it an easy choice for this build. The Gebla Rohbox ratchet box pairs with modified Campagnolo or SRAM shifters, making it a great choice for drop bar riders who find the Rohloff twist shifter unappealing. Naturally, we took full advantage of the included braze-ons for this utilitarian machine, with front and rear racks from Tubus capable of hauling the groceries as well as bikepacking gear. 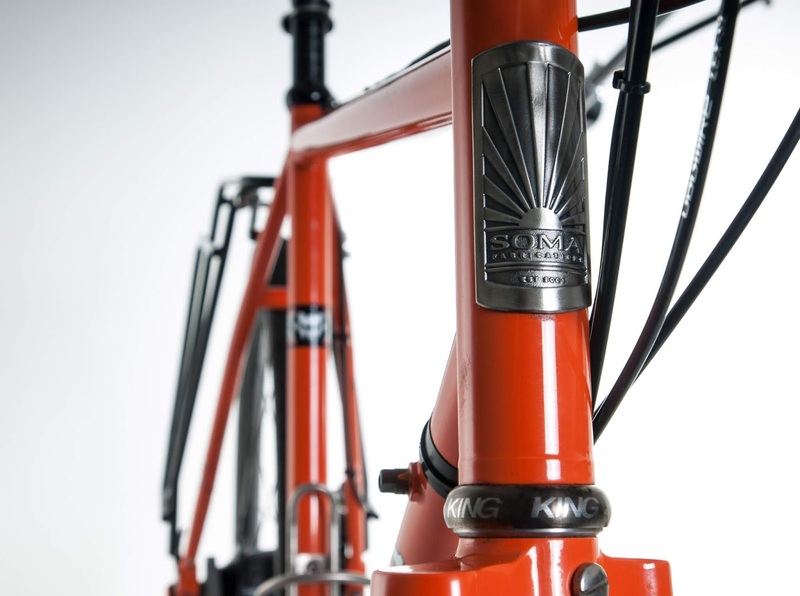 Front and rear lights on this build are courtesy of Schmidt, and are powered by a SON dynamo front hub. Dynamo hubs contain a small electric generator that self-powers lights and other electronics as you ride. They’re an ideal solution for commuters and bikepackers, because they keep your lights running both day and night with no need to charge. Wolverines are known to be vicious, but we wanted to ensure the bike provided a friendly ride with all the mileage it’d be getting. High volume Schwalbe Marathon Plus tires provide a cushy ride without sacrificing efficiency, while hydraulic disc brakes provide ample stopping power with lots of modulation. Comfort at the most important touchpoint comes thanks to an all-leather Brooks Saddle mounted to Cane Creek’s Thudbuster seatpost. As the name implies, the Thudbuster mitigates the jarring effects of rough roads by isolating the rider’s seating position from the frame with 76mm of travel right in the seatpost. 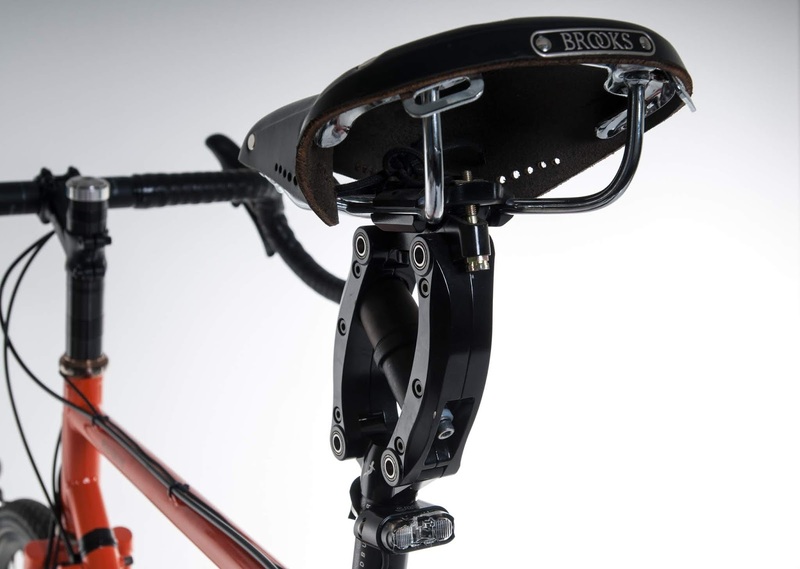 Paired with a high-end saddle like those from Brooks, the Thudbuster adds a significant amount of comfort to any bike with a rigid rear end, and it might just save yours. With a low-maintenance, belt-driven internal drivetrain from Rohloff and Gates, an always-on lighting system from Schmidt, and ergonomic touchpoints for comfort over the long haul, this Soma Wolverine is just one example of how these versatile steel frames can be built up. They’re a perfect building block for the worry-free bike we love to put together at Cycle Monkey. Order yours today, and drop us a line so that we can bring it to life with a custom build kit perfect for the way you ride.